The Year of the Dragon gives way to the year of the Snake in 2013. It is the Year of the Water Snake, which begins February 10th, shortly after the New moon in Aquarius, the humanitarian of the zodiac, and lasts until January 30th, 2014. The snake is the sixth of the 12 zodiac animals and is a fire element based on the five-elements theory. So, 2013 is a year with a yin water element yet the snake itself is fire. Water and fire normally don’t mix well and will cause turbulence. But the 2013 yin water, gently heated by the fire element, should provide comfort to many. Think about it like this: a steady fire that boils water provides us with comfort and warmth. A few points to ponder as we move into this new year of the “fire snake” during a water year, elementally speaking. Curious to note that in a numerological context the year is a six, which relates to the higher self, balance, harmony and compassion, which ties right into the fire and water concept. In the five fists of Goju, the snake represents inner breathing dynamics and healing. It is also curious to note that the Nazarene, who was the greatest healer to ever live entered the reality in the year of the snake. The snake energy also represents emotion as a motivator originating from the activation of the Kundalini energy rising up inside the body. - Powerful portents, to say the least. Everyone has heard of the magnetic pole shift potentials in the last few years and this is actually a result of the Kundalini energy of the planet shifting. Through training and meditation one can tap into this energy literally starting with proper breathing and also contribute to its manifestation in a positive way. We live in a mirrored reality where the planet responds to mankind in the same way children will respond to their parents reflecting back what is projected. It’s important to keep in mind what is being projected and keep it positive. The unfed mind will devour itself so make sure you are planting good seeds to cultivate positive thoughts especially with children. Know the moment and keep it perfect in principle ie: the reality is the light not the dark. - A simple but powerful concept to use with children when you attempt to explain the unexplainable of man’s inhumanity to man. The largest machine in the world is dedicated to learning about the smallest particles and how they interplay and how we interface with them to create reality. What they are learning in Switzerland is how much they don’t know about what’s happening on a quantum level. Suffice as to say the cognitive mind has a long way to go in comprehending what’s really happening in and around us in this dimension and others. The first step to enlightenment is to “lighten up” by first stopping the attempt to explain the extraordinary with an ordinary mind. Let the intuition come through especially with children so the inner voice can be heard and expressed. Most of the issues many are dealing with are spiritual not physical so don’t ask the barber if you need a haircut; yesterday’s answers don’t answer today’s questions. In Zen this is where the path precedes the concept. Do not be concerned with the dualities of who is wise and who is not, or is it sharp or dull. Just practice wholeheartedly whatever you choose to do and intuitively master the little moments now by knowing the moment and making it perfect. This is spirituality at a very high level that even children can achieve when they have a sense of internal balance of how to formulate their inner thoughts (water) and when to express (fire). 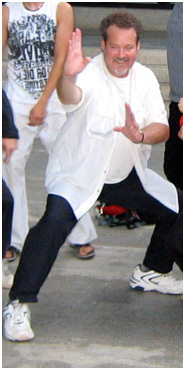 This ability starts with the breathing and expands with meditation both sitting and moving (kata). That is why you will always hear the phrase in Budo that the way is in training. Even the most modern ship on the planet will sink in the middle of the ocean if it does not keep moving.